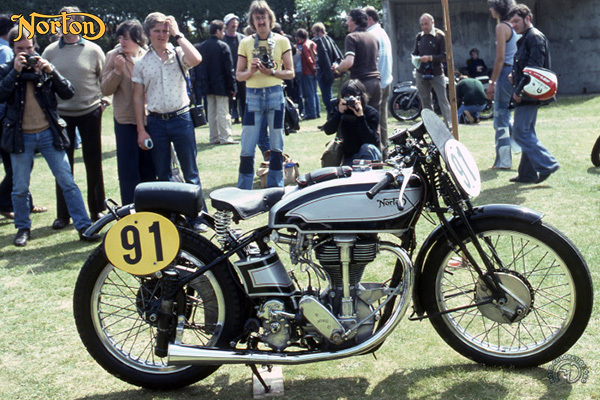 To race a Norton before WWII, one had to order an International Super Sport model (350 or 500cc) "to Racing Specification." In 1939, the "Inter" was available for the first time with the square-finned aluminum cylinder head used on the works machines. First marketed in 1932, the International was named in honor of the victories achieved by the marque all around the world. The first version was virtually a copy of the machines that had made the Grand Slam in 1931 by winning all seven European 500cc Grands Prix. The improvements made over the years on the works bikes were offered to private buyers as options. For example, the plunger rear suspension used on 1936 works Nortons was catalogued for around $23 in 1938. The list of options available in 1939 was impressive. It included the famous cylinder head with square finning and cylinder (both in aluminum), rear suspension, a fuel tank with quick-fill cap, a large-capacity oil tank (also rapid fill), a special exhaust pipe, racing tires, handlebar controls, Amal Racing carburetor, BTH magneto, special clutch and a close-ratio gearbox without kick-start. Though the works bikes had been fitted with twin-cam cylinder heads since 1937, in 1939, the International kept its single overhead-camshaft with external rockers. It was still the best-performing 500 club racer at an affordable price. The ultimate classic bike, this 1939 "Inter" has all the racing equipment – the square-finned cylinder head, rear suspension and racing fuel tank.